Jambeaux, everyone!!! Harambe! 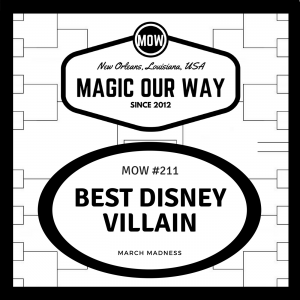 On this episode, we present our bracket episode for 2018: Best Disney Villain. Who will come out on top? Listen to find out. For this Hub, we present out March Madness bracket for 2018: Best Disney Villain. 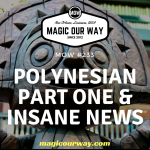 We start out with 32 Disney Villains and whittle them down to one villain to reign supreme. In order to arrive at the starting 32 villains, we each submitted our top 8 villains in each of 4 categories: the Disney Animation Universe, the Pixar Animation Universe, the Star Wars Universe, and the Marvel Cinematic Universe. We combined our lists and took what we felt were the top 8 in each universe. Then, we considered some of the ones that didn’t make and see how they stacked up against the ones that did. If we determined that the wild card was worthy of a spot, we replaced the villain we thought would win out between the two. We have posted our bracket for you to download below. What are your thoughts regarding our bracket? Is there a villain not in the original 32 that you felt should be there? Any comments? We would love to hear your opinions. Share them at show@magicourway.com. 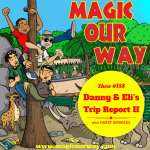 Your opinions are always welcome on our show. Seriously, every opinion is welcome.